Over the last several years, scores of poor, young Pakistani children have immensely benefited from this endeavour. Chennai based craniomaxillofacial surgeon, Prof. Dr. S. M. Balaji being honoured with the Pakistan Dental Association’s Humanitarian Award. 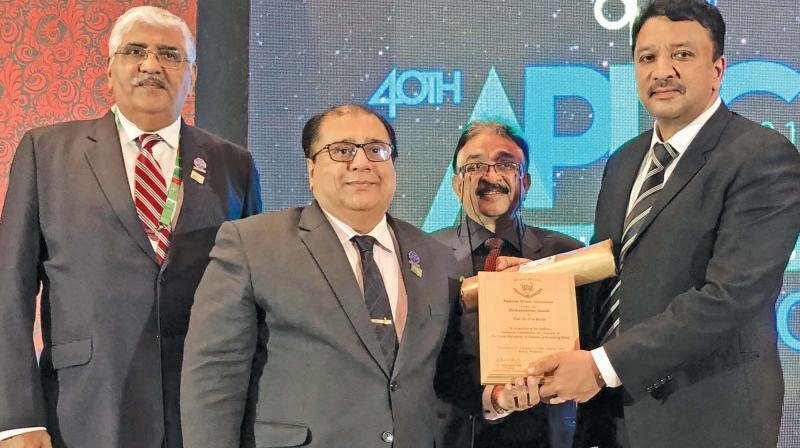 Chennai: In a rare gesture in these times of India-Pakistan tension, Chennai based craniomaxillofacial surgeon, Prof. Dr. S. M. Balaji has been honoured with the Pakistan Dental Association's Humanitarian Award. Years ago, in an international meeting organised by Asia Pacific Dental Federation, the PDA, with a membership of over 1,000 dentists, had invited Prof. Balaji to lecture in Pakistan. Since 2010, PDA has been regularly referring patients with complex craniofacial developmental abnormalities to the doctor in Chennai. The children are usually from low socio-economic category and the association would pool in resources for arranging the treatment and travel to Chennai. Prof. Balaji has been providing free surgical treatment to such needy patients from overseas. Over the last several years, scores of poor, young Pakistani children have immensely benefited from this endeavour. In recognition of the humanitarian service rendered, the PDA leadership felicitated Prof. Balaji in a special award ceremony held along the sidelines of the 40th Asia Pacific Dental Federation 2018 meeting in Manila. The PDA President, Dr. Mahmood Shah, Vice President, Dr. Asif Arain and Secretary General Dr. Nasir Ali Khan presented Prof. Balaji with the award. Prof. Balaji is the first Indian to receive such an honour from the Pakistan Dental Association. He is an expert in the field of craniomaxillofacial surgeon through which he has changed the lives of many patients who have come in with problems like hare lip and other facial deformities. In fact, the award winning short film Smile Pinki portrays well the kind of service rendered to such people in terms of their gaining self-confidence by surgeons like Prof. Balaji.